Katina Gosey, the creator of Alky Therapy in Shreveport, is quite possibly Louisiana’s queen of the daiquiri. This humble, unassuming Louisiana native with a background as a biology teacher and a penchant for “going over the top” is raising the bar on these frozen concoctions dishing out blended daiquiri with names like Papa Smurf, Shark Attack, Marley, and Watermelon Margarita. These mixed works of art come in a variety of colors and flavors adorned with slices of king cake, pudding shots, gummy candies, and additional single shot servings of rum or vodka making these daiquiris almost too pretty to drink or eat, almost. Katina says it is her background in the science field that has helped her create these one-of-a-kind daiquiris. She says that her knowledge and understanding of the scientific method has allowed her to develop a well guarded secret ratio of alcohol to “other” ingredients that allow her daiquiri to remain frosty for a couple of days in the refrigerator and not melt like other frozen daiquiri. This frozen longevity is one of her trademarks that has people from neighboring states making the road trip to her drive-thru to buy her daiquiri. She says, “if they are an hour or so away, by the time they get home the daiquiri will still be frozen.” For frozen safety on more prolonged drives, you may want to bring an ice chest. A trade secret I can share with you is that Katina does not use a typical daiquiri machine, instead uses a unique type of machine that will freeze the mixture into an ultra thick lush. She then pours the slush into plastic jars which double as the serving containers and freezes them at -22 degrees. When a customer places an order, she pulls out the appropriate plastic jar, removes the lid and piles on extra goodies until they are practically spilling over the edge. The daiquiri cup is then placed in a large styrofoam cup with a cover to comply with Louisiana’s Open Container law. One of Katina’s pet peeves with other daiquiri is the ice. She says that most mixologists add ice to their mixtures which waters down the flavor. Katina says that her daiquiri will have the same intense fruity flavor melted as it did when it was frozen because she does not use ice to thicken her daiquiri. King cake daiquiri only available during Mardi Gras. Currently, the menu has 16 different flavors available with a unique flavor of the month quite often centered around a holiday theme. The Marley, a decidedly Caribbean motif in red, yellow, and green with Hurricane, Mango Daiquiri, and Margarita mixes is the most popular menu item and the easiest to make Katina says. What is the most difficult drink to make? Katina says, “Candy Crush by far! It is a mix of six different flavors and has the most candy on it.” Katina explains the origin of this drink did not come from the game as many might think. It came from “screwing up” other drinks by mixing in the wrong alcohol or color. Katina, being frugal did not throw out the mix. Each drink only takes a minute or two to make, so the delivery time is quick. Katina says that the delay is actually in the ordering. She has yet to have a car in her drive-thru that orders just one drink. Prefilling and freezing the individual containers helps to keep wait time in the drive-thru line minimal and helps to maintain proper consistency of these frozen flurries of delight. When I asked Katina what prompted the change from biology teacher to Daiquiri Queen, not considering herself libation royalty she quietly laughs a little but is excited that people are so enamored with Alky Therapy and “get” her vision. Confirmation of her customer’s captivation with Alky Therapy is evident with a 70 percent customer return rate, and usually, they are bringing a friend with them to introduce and share the experience. For most states, driving with an open alcohol container is illegal. In Louisiana, there are a few exceptions. For example, according to Louisiana’s Open Container Law an open alcoholic beverage container shall not mean any bottle, can, or another receptacle that contains any amount of frozen alcoholic beverage unless the lid is removed or a straw protrudes through the lid. Other exceptions to the law include passengers riding on a parade float may have open containers, and you can walk the streets of the French Quarter in New Orleans with open plastic containers. 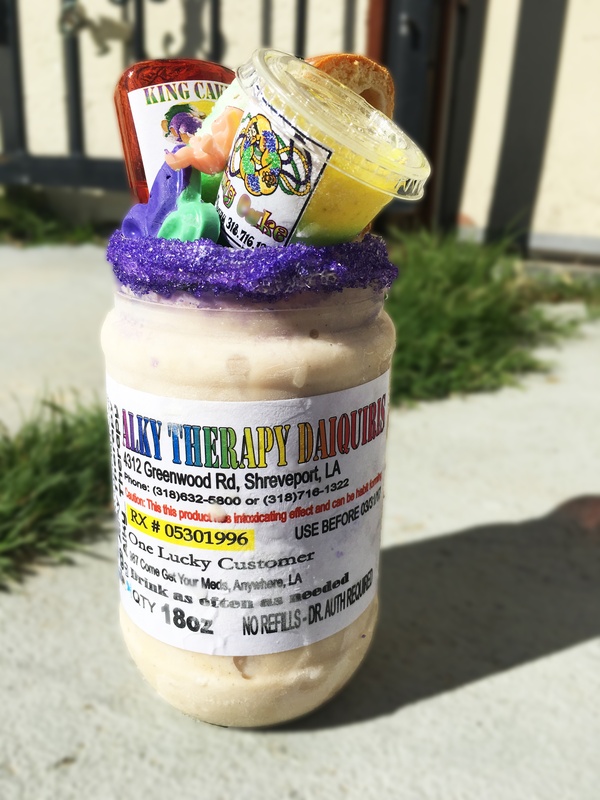 To get your daiquiri prescription filled, make your way to the Alky Therapy drive-thru parked at 4312 Greenwood Road in Shreveport, Louisiana. Katina recommends that for faster service to call 318-716-1322 to place your order for pick-up. Hours of Operation: Thursday 3 p.m. – 10 p.m., Friday and Saturday 3 p.m. – 11 p.m., and Sunday 3 p.m. – 8 p.m. Check out Alky Therapy on FaceBook or Instagram. Thanks Donna for sharing the information on Frozen Daiquiri’s, specially made by Katnia in Shreveport. I can understand why so many people would like to have her secret on keeping her daiquiris frozen for hours. Think of what other things the food industry might be able to do with her ‘secret formula’. I guess there is always room to learn something new.